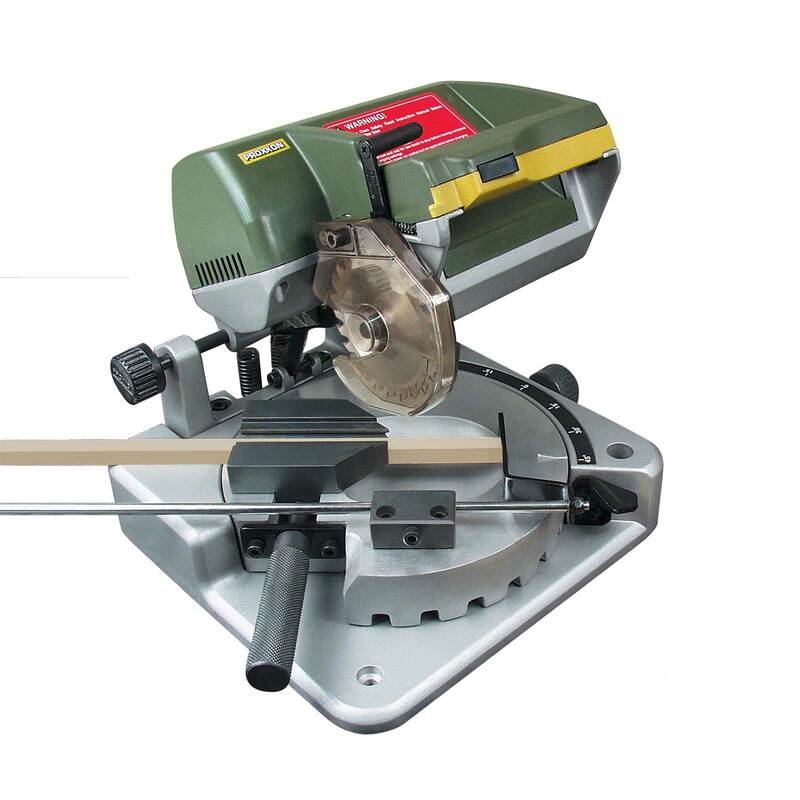 The Proxxon Heavy Duty Miter/Chop Saw cuts and miters both small- and large-size hobby materials quickly and precisely. The rotating work table incorporates a beautifully machined vise which clamps the workpiece at the exact angle you need. The smooth-running saw head adjusts left/right to minimize the gap between the vise and the blade to eliminate accuracy-robbing deflection or vibration of workpieces. Vise jaws have a V-groove to securely hold round pieces, plus a top groove to hold thin stock. The blade is belt-driven at 4,000 rpm by a 1/4hp DC motor. Cutting capacity is 1 inch at 90 degrees and 3/4 inch at 45 degrees. The base rotates 45 degrees in both directions from 0, with latching detents every 15 degress for quick and accurate set-up. Includes 3-1/8 inch dia. carbide-tipped 24 tooth saw blade for cutting non-ferrous metals, wood and plastic, plus finger-tip safety release, motor-start switch, automatic blade guard and adjustable stop plate for lengths up to 12 inches. Plugs into 120v AC wall socket. Overall size: 9 inches x 9 inches x 9 inches. Order special blades separately.